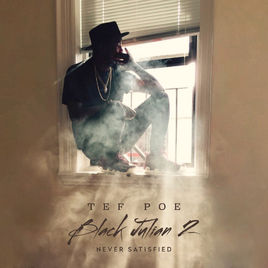 Ready or not, Tef Poe is back with a new album that may very well be his finest work to date. Black Julian 2: Never Satisfied - is the perfect album for today's social and musical climate. Tef is a globetrotting activist, a thinker, a student, a teacher and one of the most versatile emcees to grip a mic. Tef is a "Soulja" that understands where he comes from but it's worth noting that he is constantly building a better tomorrow for himself and his loyal legion of supporters. This amazing rapper is comfortable with the Boom Bap, the trap and every style in between. He is armed with an arsenal of tracks featuring diverse production styles and potent lyrics. One of the greatest intellectuals of our time, Cornel West can be heard throughout the record, adding to the urgency of Tef's call for change in America and around the world. On "70" our hero from the 314 addresses rappers,Donald Trump and neo nazis tying it all together with an infectious hook. On "No Remorse" He addresses how once friendly relationships can quickly become volatile. When he name checks other greats like Nas ("Thank God for Nas") and Rihanna ("Rihanna") it's always deeper than it appears on the surface. Obviously, Tef is a "Soulja" that understands where he comes from but it's worth noting that he is constantly building a better tomorrow for himself and his loyal legion of supporters. Whether you're a lifelong supporter or a new fan, you'll be doing yourself a favor by checking out Black Julian 2: Never Satisfied- available wherever great music is sold! In February Poe will also be at the Denver Lift School of Theology co-instructing a course on "God and Tupac" with Dr.Jennifer Leath. Poe and his FMG imprint intend on giving back to the fans as they celebrate the success of Black Julian 2:Never Satisfied by making this event free to the public for the first hour of the performance.